A few weeks ago when The Kid had her wisdom teeth pulled, I mentioned getting trapped by the clearance health food section in Target. Yes, I fell for their tricks and evil ways and got a few healthy microwaveable meals. Everything I’ve tried so far was pretty darn tasty, but out of my price range for non-clearance purchases. My first attempt at a recreation went pretty well when I made Grilled Chicken with Cuban Black Beans and Rice. Heat a large pot over medium heat and spray with non-stick spray. Add the onions and garlic and saute for about 5 minutes until softened. Add the veggies, broth and water and bring to a boil. During this time the veggies will start to cook and wilt slightly. Stir in the raisins, salt, and grains and cover the pot. Lower heat and simmer for 25 minutes or so until the liquid is absorbed and the grains are cooked. You want to check it every now and then while cooking to make sure the water hasn’t boiled off and to give it a stir. Makes 4 servings at approximately 229 calories each – 8g protein, 49g carbs, and 2g fat. You can use 1/2 cup of any type of broth that you have on hand. I used beef, but chicken and veggie also work well. You can change up the grains if you prefer a different type or mixture. 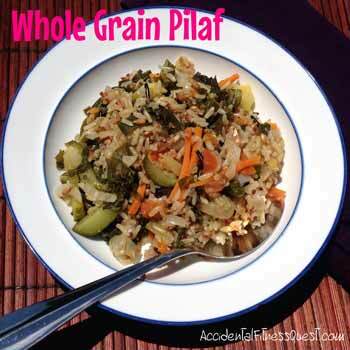 You want to use 1 cup total, but give farro, wheat berries, white rice, and other grains a go. You can use different veggies if there are others that you like better. Spinach might be a nice change from kale. I topped mine with grilled chicken to add more protein onto it. You can eat it straight up or with grilled chicken, steak or tofu. I wonder what I should work to recreate next. Hmmmm.